It depicts the DNA of Amazon, Facebook, Google and Apple. 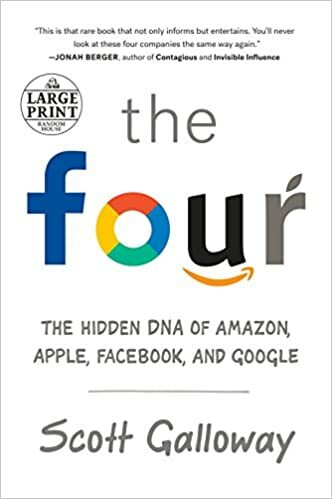 Summary: For all that’s been written about the Four over the last two decades, no one has captured their power and staggering success as insightfully as Scott Galloway. First I wonder why Microsoft isn’t in this analysis? But anyway, while it seems that a consensus is building up on how bad it can be for the kids to be too exposed to smartphone (and social media, search, etc), it is interesting to read the FOUR. Why? It first brings you through the huge success of those companies. And not being from the US, one cannot perceive how huge Amazon, for example, has became. Clearly. This is amazing for the FOUR and that success is at a scale never seen before. It clearly goes much beyond technology. How much those companies are sort of global monopolies with no friction. Some frictions are showing in Europe where regulators are questioning fiscal issue, privacy, etc.). Now the success (ei: 44% OF U.S. households have a gun, and 52% have Amazon Prime account) comes at a cost. Cost for each of us as we are ready and have given unprecedented access to our private data to any of those companies. Then they ferociously fight other similar players in their respective sectors. The Amazon growth is at the expense of any other retail player (including Walmart). Galloway also states that it is the end of the “Brand” model (How to create a Brand that might do better? There will be new companies, the question is will they be able to grow without having one of the FOUR buying them before being able (having the scale) to fight one of them?). The other question one can ask is: If those companies (that are acting almost like monopolies) are so relevant, why aren’t they becoming sovereign power and authority? Will policy maker do something about this? Then will the FOUR start to fight each other? Galloway states that the search fight is being won by Amazon (55% of the search for a product start on Amazon while only 28% from Google). Product Differentiation – You must have a differentiated product in today’s world. Visionary Capital – Your business must have a bold vision that attracts cheap capital. Global Reach – The business must have a global reach for bigger numbers and diversity of the market. Likability – Image matters and a business must be loved to excel. Vertical Integration – The business must control their destiny. They don’t have to own all aspects of the vertical but they must control it. AI – To be relevant in today’s business world, you must collect, algorithmically analyze, and leverage consumer data. Accelerant – Your business must attract and retain top talent. This is an accelerator! Geography – Your business must be in close proximity to world class technical or an engineering teaching university. You must also be located in a progressive city that supports technology based companies and has the economic foundation to support growth. This entry was posted in Techno Management and tagged GAFA, management, social, society, technology. Bookmark the permalink.